The IBRRC Team arrived in Louisiana today. Our team is working in partnership with Tri-State Bird Rescue & Research. Our organizations have a long history of working together on oil spills. Together, our team has begun setting up a rehabilitation facility in a warehouse in Fort Jackson, LA just north of Venice about 70 miles from New Orleans. There has only been one oiled bird recovered so far, a young Northern Gannet, which is being treated at the Fort Jackson rescue center. The bird was covered in thick, black oil and found offshore. Another center is being set-up in Theodore, Alabama and staff from Tri-State Bird Rescue and International Bird Rescue are there beginning to set things up. There are existing oiled bird treatment trailers in the area that were funded by Clean Gulf and Chevron so these are also being set-up to assist with stabilization of animals if necessary. As of right now our teams are very much focused on preparing these facilities. There is still not a great need for volunteers at this time as there is only one bird in care. Remember, if you are interested in volunteering you must call the Volunteer hotline at 1 866-448-5816. And a big thank you to our partner, Procter & Gamble Co, who is sending 50 cases of Dawn dishwashing liquid to both centers. Dawn has supported us for more than 20 years on efforts to save aquatic birds worldwide. 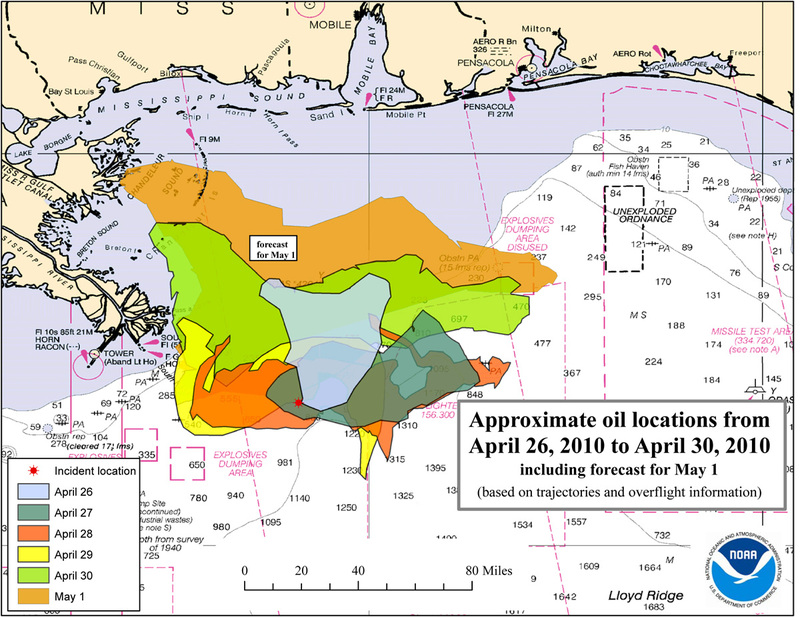 The National Oceanic and Atmospheric Administration (NOAA) released a map this afternoon showing the approximate oil locations off Louisiana and Mississippi coastlines. According to U.S. Coast Guard estimates, 1.6 million gallons of oil have already gushed out of a deepwater well 45 miles off the coast of Louisiana. Oil is leaking 200,000+ gallons a day (5,000 barrels) and officials say capping the exploded well may take months. 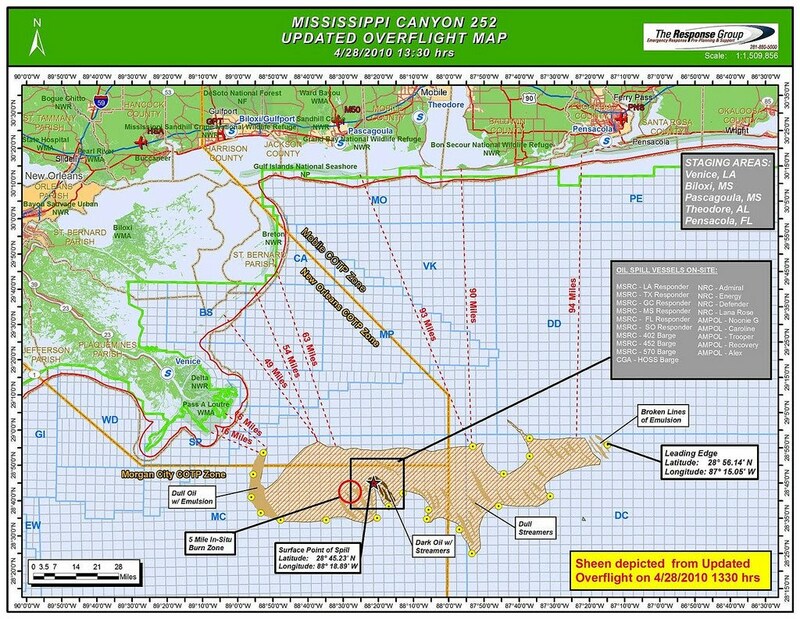 The ruptured well is in 5000 feet of water was leased by BP Petroleum. A team of aquatic-bird rescue specialists from International Bird Rescue Research Center (IBRRC) in California have been activated in an effort to support local groups preparing for oil spill impact on wildlife in Louisiana. The team of four wildlife rescue experts will be led by oil spill veteran and IBRRC Director, Jay Holcomb, who has responded to 200+ oil spills around the world, including the 1989 Exxon Valdez oil spill. The team will be working to support local wildlife groups and other organizations as preparations continue for the potential of wildlife casualties from the Deepwater Horizon spill. As well as Holcomb, the team will include a team veterinarian, rehabilitation manager and capture specialist. Once on the ground, the International Bird Rescue Team will work with local organizations to determine the need for additional deployments in the coming days or weeks. Jay Holcomb – Jay has been the Executive Director at International Bird Rescue Research Center (IBRRC) since 1988. Since then Jay has led IBRRC’s oiled wildlife rescue team on over 200 oil spill responses around the world, including spills in France, Germany, Spain, Norway, Estonia, Mexico and the Galapagos Islands as well as in the US. Heather Nevill – Heather is a native of Louisiana and is IBRRC’s Response Team Veterinarian as well as the Veterinarian for IBRRC’s Los Angeles Bird Rescue Center. Julie Skoglund – Julie is the Rehabilitation Manager for IBRRC’s Los Angeles Bird Rescue Center. She has responded to over a dozen oil spills and recently managed the rescue of over 400 brown pelicans in Southern California. Duane Titus – Duane is a member of IBRRC’s Emergency Response team as well as a Capture Specialist for California-based WildRescue. Duane is a Facilities and Search and Capture Specialist. IBRRC isn’t a stranger to Louisiana oil spills. In 2005 it assisted local wildlife rescue groups following the Tropical Storm Arlene. Following the storm, Breton National Wildlife Refuge was hard hit, where thousands birds were in the middle of nesting season. As the storm swept over the area it carried with it light crude oil that had spilled from a nearby oil rig. Even though the spill was only 12-15 barrels, the storm carried it on the waves, which swept over the low island, covering the pelican chicks with oil. Within days a large warehouse in Venice, Louisiana had quickly been converted into a mash unit with 70 wildlife specialists and veterinarians evaluating and medically stabilizing the surviving birds before they could be washed. A total of 959 birds were recovered; all but three were brown pelicans and of these 268 were live chicks. As an individual, you may feel you can’t help oiled wildlife. You can. Help the non-profit organizations that help oiled animals in your area. If you live in a coastal area, there is an organization struggling to help them – support it. If you live in California, you can help support International Bird Rescue’s ongoing rescue work by donating, becoming a member or adopting a bird. IBRRC has been receiving an outpouring of support and phone calls from people wishing to volunteer to help at the Gulf Oil Spill. Although our team has been activated, anyone wishing to learn how they help must contact the BP Community Support Team Hotline at 1-866-448-5816. Note this is voice mail system, so be ready to leave a message with your contact information. To report oiled wildlife affected by the Gulf oil spill please call the Wildlife reporting hotline at 1-866-557-1401. Note: Please understand that while IBRRC knows you may want to help, we’re not the lead organization in this spill and will not coordinate volunteer resources at this time. 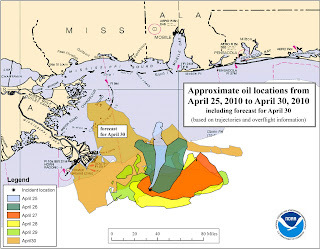 In a new urgent update, officials now are predicting oil from the Gulf of Mexico spill will reach parts of the Louisiana coast today – not Friday as previously reported. 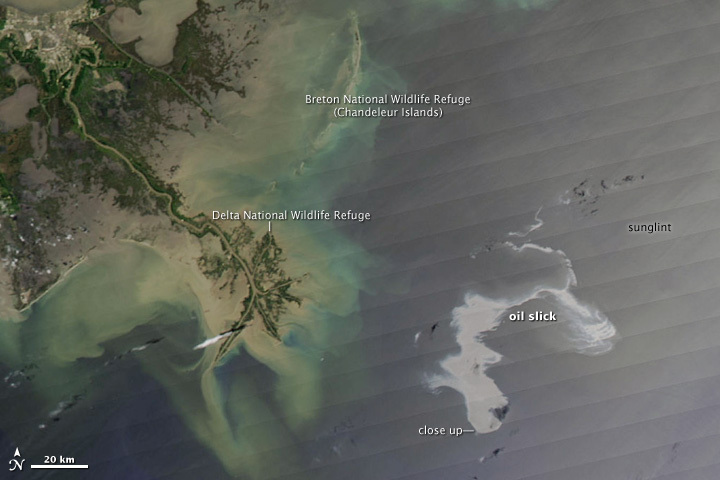 The oil spill involves a deepwater drilling platform approximately 50 miles southeast of Venice, Louisiana. An explosion and subsequent fire damaged the rig, which capsized and sank on April 22, after burning for hours. It is unclear how much of the estimated 700,000 gallons (approximately 16,700 barrels) of #2 fuel onboard burned before it sank. The rig is owned by Transocean and under contract to BP. Today the Coast Guard changed the amount of oil spewing from the uncapped rig to over 200,000 gallons a day. The news doesn’t get any better for the Gulf of Mexico oil spill. The U.S. Coast Guard says its five times larger than previous estimates. The leak is now spilling 5,000 barrels — or 210,000 gallons — of crude oil a day, not a 1,000 barrels that was originally reported. During a Wednesday night press conference, Coast Guard Rear Admiral Mary Landry confirmed that a third leak on the sunken drilling rig had been discovered. The oil platform exploded and sank in the Gulf on April 20 about 50 miles off the Louisiana coast. According to reports from the National Audubon Society, “Important Bird Areas” or IBAs that could be threatened by the slick include, Chandeleur Islands IBA and Gulf Islands National Seashore IBA in Louisiana and Mississippi; also in Louisiana, the Delta National Wildlife Refuge and Pass-a-Loutre Wildlife Management Area. Meanwhile engineers continue to work feverishly the cap the well but have been unable to stem the underwater gush of oil. The drilling rig, Deepwater Horizon, exploded nine days ago and sank in 5,000 feet of water. More than 100 workers scrambled off the burning rig in lifeboats. 11 workers are missing and presumed dead. News reports say that up to 4 million gallons of oil may end up in gulf waters from the BP leased well. The Exxon Valdez spill, the nation’s worst, spilled 11 million gallons in Alaska waters in 1989. 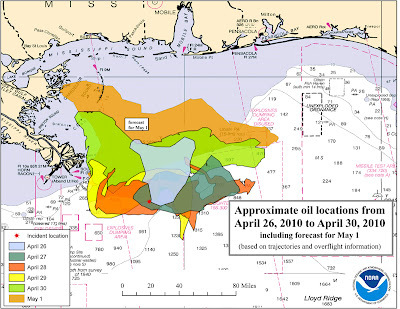 The Coast Guard and other agencies have setup a Deepwater Horizon Response web site: http://www.deepwaterhorizonresponse.com/go/site/2931/ The site has maps (above), command center reports and photos. 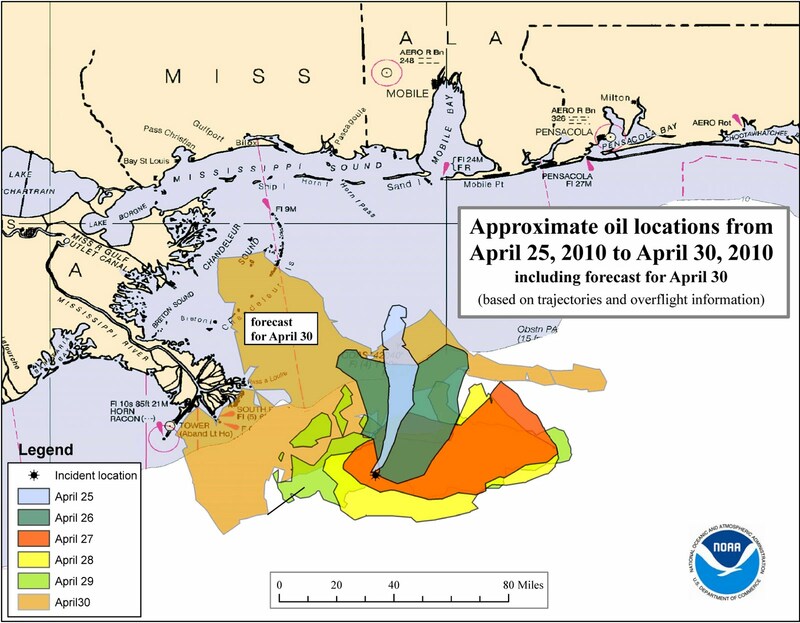 As oil drifts toward land, the U.S. Coast Guard said Wednesday that it will set fire to an oil spill in the Gulf of Mexico. The “controlled burn” would involve setting fire to an area of oil trapped by special containment booms on the ocean’s surface. About 1,000 barrels (42,000 US gallons) of crude are leaking every day after the Deepwater Horizon rig exploded and sank last week. At least 11 of the rig’s workers are still missing and presumed dead 50 miles off the Louisiana coast. Officials estimate the oil slick has a circumference of about 600 miles (about 970 kilometers), though the shape of the spill area is very irregular. 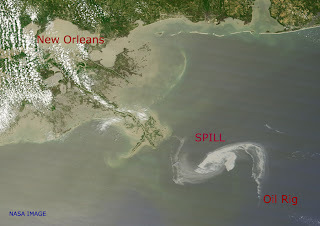 The spill is big enough to be seen from space. IBRRC is still on alert for the spill and is ready to lend a hand. The bird rescue group has nearly 40 years of experience in working on oil spills. In 1989 a response crew spent 6 months in Alaska working on bird collection and care in the aftermath of the Exxon Valdez spill in Prince William Sound. That spill dumped 11 million gallons of oil into the fragile waters and killed hundred of thousands of birds and mammals. Pledge/vote on World Oceans Day at Oceana! We’re pleased to announce that on World Oceans Day, Oceana is honoring those who have made a significant, ongoing contribution to ocean conservation. Also, for every pledge made, Oceana will receive a $1 donation. Oceana Video 2009 from Oceana on Vimeo. If the spill stays offshore then the impact will likely be minimal to birds. Coastal birds that are highly at risk if the spill hits shore are brown and white pelicans, terns, gulls, shorebirds, skimmers and herons. Nesting and feeding areas for birds and sea turtles such as marshes and beaches could be impacted. The good side of this situation is that there are not large populations of pelagic birds that float or feed in the offshore areas unlike the Northern Pacific and Atlantic Ocean regions where massive populations of marine birds tend to forage and raft up. So, impact to bird species in the offshore gulf region is very limited as long as the oil stays significantly off shore. Sea turtles are vulnerable to these types of spills as they have been known to mistake globs of floating oil for food and they have to come up for air so there is possible impact there. We will keep our blog updated and let everyone know if we are activated. In the mean time all of the news media is keeping a good eye on the situation and they will provide updates and current spill trajectories. 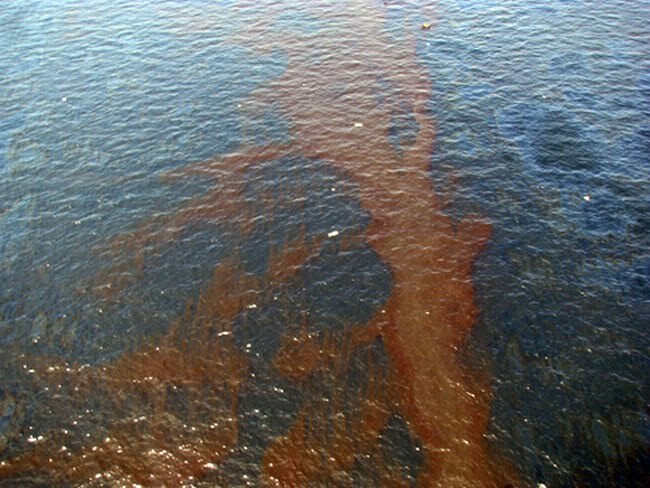 An oil leak from the Deepwater Horizon well in Gulf of Mexico is causing widespread concern for the fragile ecosystems along the coasts of Texas, Louisiana, Mississippi, Alabama and Florida. 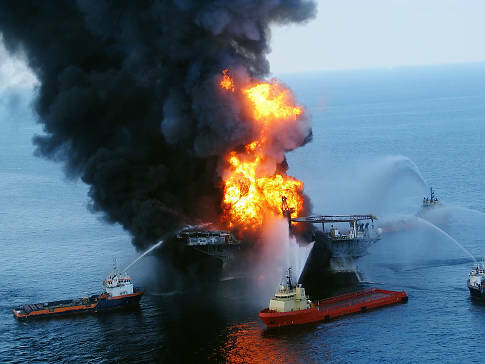 Last week a BP leased oil rig 50 miles off the coast of Louisiana, blew up and caught fire. At least 7 crewmen were injured and 11 missing men are now presumed dead. 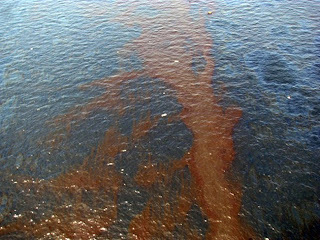 After the oil rig capsized up to 42,000 gallons (1,000 barrels) of oil are spilling into the Gulf daily. Up to 700,000 gallons of diesel fuel also leaked into the Gulf when the Deepwater Horizon oil rig went down. 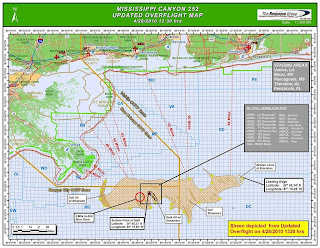 It may take months for BP to cap the oil leak deep beneath the ocean floor. On April 27, news reports say engineers are building an enormous underwater dome to contain the oil spill. Earlier attempts by using robotic submarines failed to cap the wellhead leak. In a video report, Jay Holcomb, IBRRC Director, reflects on how DAWN dish washing detergent became the number one tool for cleaning oil from wildlife. More than 30 years ago, the IBRRC was seeking a solution to clean oil from bird’s feathers. IBRRC discovered that Dawn dishwashing liquid was powerful enough to effectively remove oil from birds’ feathers, while remaining gentle on their feathers, skin and eyes. Since then, rescue groups worldwide have chosen Dawn to clean aquatic animals. So far more than $370,000 has been raised in the DAWN Everyday Wildlife Champions program to support two wildlife organizations in California. For each bottle you purchase—and then activate it online using the bottle donation code—one dollar* is donated to our wildlife conservation partners. 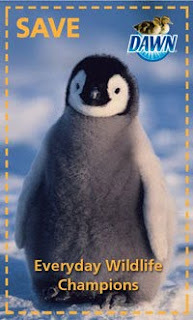 Fifty percent of each dollar is donated to the International Bird Rescue Research Center (IBRRC) and fifty percent is donated to the Marine Mammal Center (MMC). Both organizations hold longstanding commitments to the preservation and improvement of animals and their natural habitats. *Up to $500,000. Must activate donation online. Rachel Carson: "A Sense of Wonder"
On this Earth Day Week a remembrance of the life and work of Rachel Carson is seems more needed than ever. If you’re looking for a film that captures her spirit and the history of the time, please tune into “A Sense of Wonder” a docudrama completed last year and now being broadcast again on PBS. Carson wrote “A Silent Spring” the groundbreaking environmental book documenting the effects of pesticides on the environment, particularly on birds. Carson’s thesis was that the chemical DDT had been found to cause thinner egg shells and result in reproductive problems and death. Carson died in 1964 of breast cancer. She was 57. There’s a National Wildlife Refuge in Wells, Maine named in her honor. Just in time for Earth Day: The 5 Gyres Project has news and videos of even more plastic trash circulating in the North Atlantic Ocean. The researchers found a soup of garbage in the Sargaso Sea – an area from Bermuda to the Azores Island – that contained stew of floating trash similar to the so-called Great Pacific Garbage Patch. North Atlantic Garbage Patch from 5 Gyres on Vimeo. Moore is credited with discovering the Pacific garbage patch in 1997. He says the Atlantic Ocean contain as much or more plastic debris. Because the Atlantic is stormier, debris there most likely have been diffused, he said. Algalita is one of the sponsors of this latest scientific efforts. The industrial world generates large amounts of plastic debris that end up in the oceans: odd pieces of plastics thrown carelessly overboard, fishing lines and nets, container ship losses and all the junk carried by rivers and streams into the ocean. These debris are a hazard to shipping and especially to marine life. 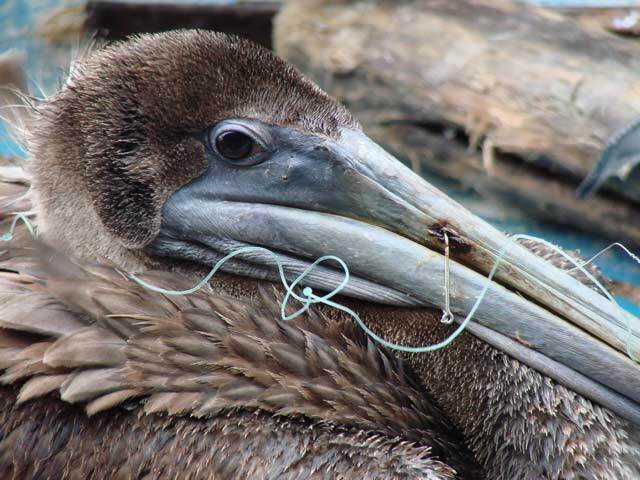 Here at IBRRC we receive many injured birds each year caught in fishing line. Also high levels of plastic debris has been found in seabirds (Albatross, Sooty-Shearwaters etc.) gizzards. 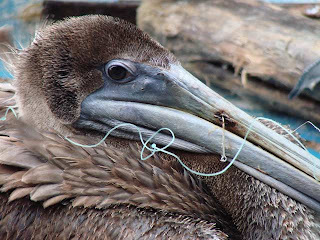 • Fishing lines and nets can take up to 600 years to decompose. • Reuse and recycle what you can. • Buy reuseable grocery bags to cut down on plastic bag use. • Tell others about the dangers of marine debris. • Volunteer for beach and stream clean-ups. • Remind others not release balloons into the atmosphere. 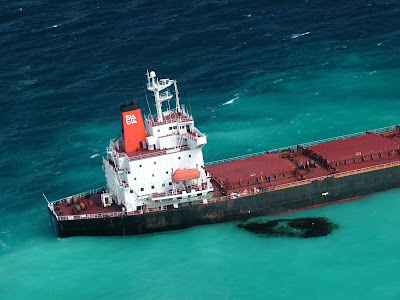 This week Australian authorities arrested and charged the master and officer on watch of the Chinese coal carrier that ran aground on the Great Barrier Reef. The ship veered off course in early April in what the government has said was a dangerous and potentially catastrophic effort to save time on the ship’s voyage. The ship strayed about 15 nautical miles from regular shipping lanes before plowing full speed into Douglas Shoal on April 3. 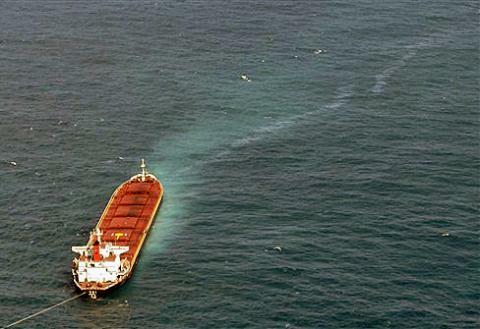 The ship leaked about 1,000 gallons of oil spread over 2 miles. Workers successfully this week moved the 750-foot Shen Neng 1 coal transport ship off the shoal without adding to the current slick. Australian authorities are scrambling to stabilize a Chinese-registered coal ship that run aground Saturday and is leaking oil inside the Great Barrier Reef Marine Park. The sudden impact ruptured the 700-foot ship’s fuel tanks and spilled approximately 1,000 gallons of heavy fuel oil into surrounding waters. Fears of the ship breaking up and causing more damage prompted officials to activate a national oil spill response plan. Most shipping companies use low-grade fuel because it’s cheap. The sludge like oil needs to be heated before being injected into engines. If it spills, it tends to be more difficult to clean up as it coats birds and other ocean animals, corals and sandy beaches in a gooey mess. The Shen Neng 1 was hauling more than 65,000 tons of coal and carrying 300,000 gallons of heavy fuel oil it carries to run its engines. It struck the reef at full speed late Saturday in a restricted zone of the marine park near Great Keppel Island off the east coast of Queensland state – about 340 miles north of Brisbane. Officials have also raised the possibility the ship was taking a shortcut through the marine park. A domestic mallard brought to IBRRC in January had pennies removed from its gastrointestinal tract. Jay Holcomb of IBRRC explains how “Penny” the duck was successfully treated by our staff and veterinarian at our bird rescue center in Northern California. She was released last week.